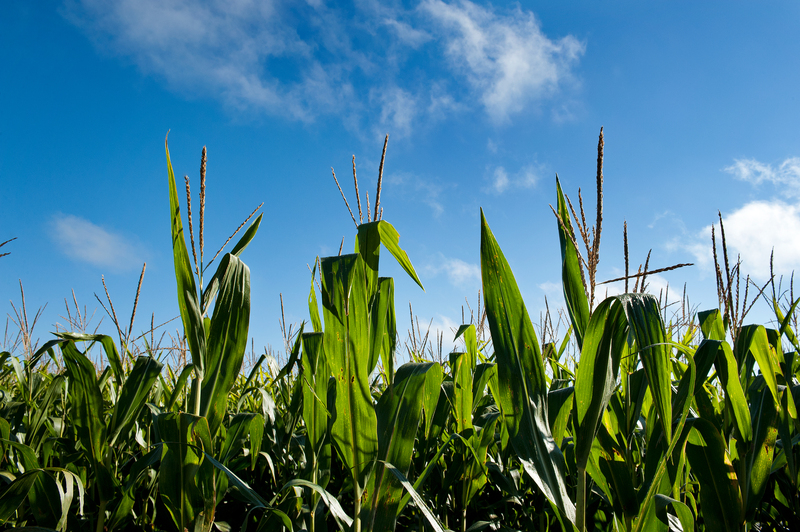 After two years of conducting nitrogen use efficiency (NUE) assessments, UW Discovery Farms has begun to analyze how Wisconsin farmers can refine their nitrogen management practices to improve economic efficiency and water quality. The data indicates that monitored fields with the lowest overall NUE tended to have high N rates and use various nitrogen sources, including inorganic fertilizer, manure, and alfalfa credits. The nitrogen cycle is unpredictable, which makes determining the right N rate for any given year difficult. This is exacerbated when multiple sources of N are added to the equation. When applying manure to a field and incorporating legumes in a rotation, there is uncertainty related to when and how much nitrogen is available to the crop. However, by reexamining current nitrogen management practices on these fields, there is great opportunity to increase NUE. Using multiple sources of nitrogen often resulted in higher N rates. Fields with lower NUE tended to have higher N rates, above 200 lbs N/ac. Fields with these low NUE values and higher N rates were more likely to use a combination of organic and inorganic nitrogen sources. Data suggest that the higher N rate drove down efficiency, not the N source. In the graph below a higher partial factor productivity indicates a higher NUE. For some farmers the higher N rate was due to the challenge of crediting and accounting for all of their N sources. For others, the high N rate was the result of adding more fertilizer out of concern that the nitrogen from organic sources would be inaccessible to the plant at the appropriate time. Higher N rates did not result in additional yield benefits. So, why did high N rates result in lower NUE? Nitrogen Use Efficiency calculates how much farmers are getting out of the nitrogen applied to their field. 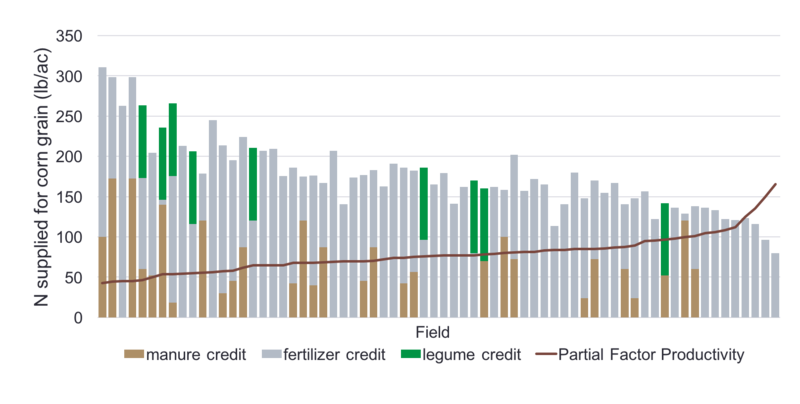 One NUE value, Partial Factor Productivity (PFP), measures the relative efficiency of nitrogen through the ratio of yield to N supplied. In high yielding conditions, like those of 2015 and 2016, yields achieved at a lower N rate were comparable to those achieved at a higher N rate. If the additional N applied is not realized in proportionate yield gains, NUE suffers. For fields with multiple nitrogen sources, this meant that higher N rates did not translate to higher yields, decreasing NUE. Reexamining N applications in fields with multiple N sources can increase efficiency and decrease N costs. For fields with low NUE, reexamining the rate, time, and place of N applications to find ways to increase efficiency is a good next step. Knowing the N content in manure, rather than relying on a book value, could be a better way to estimate manure N credits. Accounting for organic sources of N first, before deciding the best rate and timing of commercial fertilizer, can reduce input costs. And considering what range of nitrogen supplied is ideal to obtain a field’s yield goal, can improve the resource allocation across fields. Multiple-source N systems do not have to equate to low NUE. As evident in Discovery Farms’ data, many fields achieved high NUE while using manure and legumes by decreasing their commercial fertilizer rates. In doing so, they received higher economic returns and reduced the water quality risk that comes along with excess nitrogen.